Today is one more Lent Friday and I believe it's really good not to eat meat at least once a week. So today's snack is Crab sticks and rice salad. 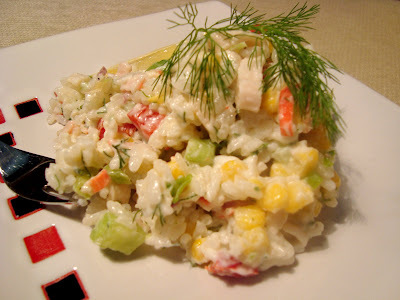 This salad is very popular in Lithuania, almost as popular as potato salad. So as I am already in Lithuanian mood ( heading for Vilnius on Monday), this salad was very right for me! 2 medium cucumbers, peeled and cut in small cubes. 1. Wash and boil rice. Let it cool. 2. Chop all the vegetables - cucumber, peppers, spring onion, dill. 3. Slice crab sticks and add to the vegetables. Then add sweet corn and cooled rice.